3 dogs sharing - £34.50 per day. All public Holidays will incur a supplement of one days board. Charges will include the day of arrival and collection. Dates booked will be charged in full. 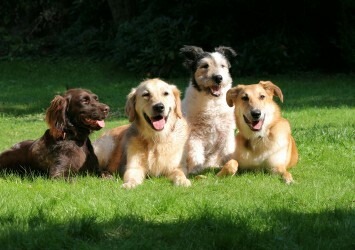 We consider all breeds of dogs providing their temperament is good. We do not allow dogs from different families to mix with each other for their own safety. Our facilities are set on five acres of grounds, totally secure and ideal for your dogs to be walked around. In both the kennels and the cattery, a radio is playing for the comfort of your pets. The 66 heated kennels at The Coppice Boarding Kennels & Cattery are comfortable and clean to ensure that your dogs are as comfortable as they would be at home. During a stay with us, your dog will be given plenty of attention, experience our dog walking services, enjoy regular meals in accordance with their eating habits and dietary requirements and receive individual care and attention. We are also happy to use your own dog food and bedding if this would be preferable. Our onsite laundry ensures that all bedding is washed frequently and returned to you in the condition in which we received it. We offer basic grooming on request for your dogs and cats which includes brushing them down and washing them during their stay. For safe, secure and hygienic boarding kennels, call The Coppice Boarding Kennels & Cattery. Our kennels come in three different sizes: a standard kennel for small dogs, larger kennels to suit bigger dogs and family-sized kennels for more than one dog.